Egypt's President Abdel-Fattah El-Sisi said on Sunday that the 2014 constitution gave the parliament wider powers than the president out of "good will" but that this is not good enough to govern a state. Experts have suggested that the 2014 constitution gave wider powers to the parliament comparable to that of the president as the two will share the duty of naming the prime minster and assigning top state officials. According to Article 146 of the 2014 constitution, while the president has the right to appoint a prime minister, parliament must approve any new cabinet through a vote of confidence on its proposed programme. The article stipulates that "if the president's government does not win the confidence of the majority of the members of the House of Representatives within thirty days at most, the president shall appoint a prime minister who is nominated by the party or the coalition that holds the majority or the highest number of seats in the House of Representatives." El-Sisi also encouraged on Sunday younger generations of Egyptians to vote in the elections, and added that he will not recommend any particular candidates for people to vote for. "I also ask the youth to vote in the elections. I won't praise a certain candidate or any party based list and I won't ask you to vote for any particular candidate. You are a generation which will never be broken," he added. Egypt's new parliament will comprise of 596 MPs, with 448 independents and 120 party-based deputies. As many as 28 MPs will be appointed by the president. The parliamentary elections will take place in October, November and December. Sisi vowed that he will show "no mercy towards corruption or people who are found to be corrupt," in reference to the outgoing agriculture minister Salah Helal who was forced to resign last week and then arrested on charges of corruption. On Saturday, Prime Minister Ibrahim Mahlab also resigned, along with the cabinet. 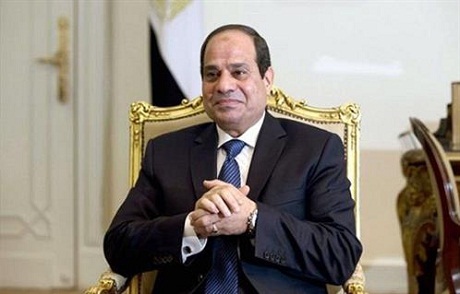 However, Sisi said that the prime minister and cabinet's resignation does not necessarily suggest that all the ministers are involved in corruption, following media reports suggesting that the outgoing ministers might be investigated on such charges. "[The prime minister and cabinets] resignation does not mean that all the ministers and the officials are corrupt," he said. On Saturday, El-Sisi ordered the cabinet to continue carrying out their current responsibilities until a new cabinet is formed, appointing Petroleum Minister Sherif Ismail as prime minister to carry out these duties. Who else is using such good faith ? Let me guess ... North Korea. Do you know than Sis become national hero because that what he did with Morsi? Most of us wish to do this, and we did wit with him. We trust him. And we do respect him. And we don't allow anyone to insult our president, we elected him and we like it so. What about the Constitution, it's OK, we haven't time to do it better. We need time to build the country. The President did the right thing by asking the Cabinet to resign, as many of us have been asking for in months! It doesn’t matter if cases of corruption are found and prosecuted; what matters more is incompetence. The current Cabinet did very little to develop the economy, almost nothing in advancing any of the sectors, be it Agriculture, Tourism, Maritime, Manufacturing, or Energy. What they did a lot of is destabilize the country with distorted policing and courts; if Egypt is safer now and more stable this would have been acceptable, but it isn’t. Incompetent cabinet is worse for Egypt than a few bad apples, because it take long time to discover and usually no ramifications. Luckily Sisi didn’t have to wait long and put up with incompetence. Let’s hope the new Cabinet is not just a reshuffle of the old deadwood, some new competent blood is called for! Infront of sisi constitution is a joke law is a game safety is a nonsens .he need as he like but so soon he forgot Gaddafi and his thankfull mubarak life results . I am suprise how any single person trust him what he did with mr morsi?unthankful unappreciate person how can be loyal of the nation ?